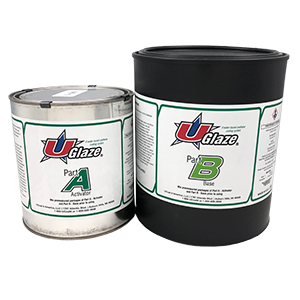 UGlaze is a water based, non-yellowing polyurethane coating system can be used to seal concrete, wood, and metal as well as a top coat over any UCoat It floor coating system. UGlaze provides an outstanding hard, high gloss finish while retaining color retention, even under ultraviolet exposure. 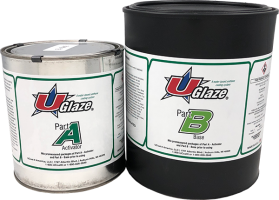 Besides providing a hard finish, UGlaze is also very chemical resistant and won’t be affected when exposed to a wide variety of harsh chemicals, aggressive chemical based cleaners or solvents. UGlaze is an excellent standalone coating over concrete, pavers or other sounds surfaces. UGlaze is also excellent for areas subject to high humidity and areas prone to fungal and bacterial growth. UGlaze can be used on vertical and horizontal surfaces and can be used as an anti-graffiti coating on structures to prevent graffiti from adhering to a surface. UGlaze is a two component system, when being applied as a standalone coating to the surface the surface should be dry. Use a 3/8” nap roller cover to apply a thin, even coat over the surface. If apply an additional coat, be sure the previous coat is tack free an do not allow more than 12 hours at 68 degrees or you many need to scuff sand to regain proper adhesion. Once completed with the application, allow 4 to 6 hours before allowing light traffic. Typical Coverage 600 sq. ft. Typical Coverage 300 sq. ft.